Docker announced support for Windows Server 2019 Long Term Servicing Channel (LTSC) and the Server 1809 Semi-Annual Channel (SAC) release within the Docker Enterprise platform. Server 2019 brings a number of improvements from previous SAC releases into the LTSC, including ingress routing, virtual IP service discovery, and named pipe mounting. This release includes being able to run Server 2019 and 1809 containers in a mixed cluster alongside Linux nodes. Windows Server 2019 brings a number of improvements from Windows Server 1709 and 1803 SAC releases into an LTSC release. This includes the support for Docker's ingress routing mesh. Ingress routing mesh is part of swarm mode and is an approach for service publishing optimized for a simple configuration experience. It provides a single "swarm port" for accessing containers for a published service, including hosts where no container is currently running. This simplifies load balancing as the routing mesh will route incoming traffic to published ports on available nodes on an active container. Server 2019 adds VIP service discovery as an alternative to DNSRR (DNS Round Robin). VIP service discovery allows containers to receive a single IP address when making their DNS query as part of Swarm service discovery. This single address is a virtual address which the networking layer routes to one of the containers supporting the service. As only a single virtual IP is returned, which is associated to the to the service, this ensures there are no stale cache records as containers are replaced. This differs from DNSRR in which a list of all container IP addresses is returned in random order to provide round-robin style load balancing. Support for running the Docker API through named pipes is also included in Server 2019. Previously in Server 2016, accessing the Docker API was done over TCP/IP. With named pipe support, you can mount the named pipe as a volume allowing the pipe to be the default endpoint for the Docker CLI to access the Docker API on the same machine. The base image size for Server 2019 containers has also been improved. 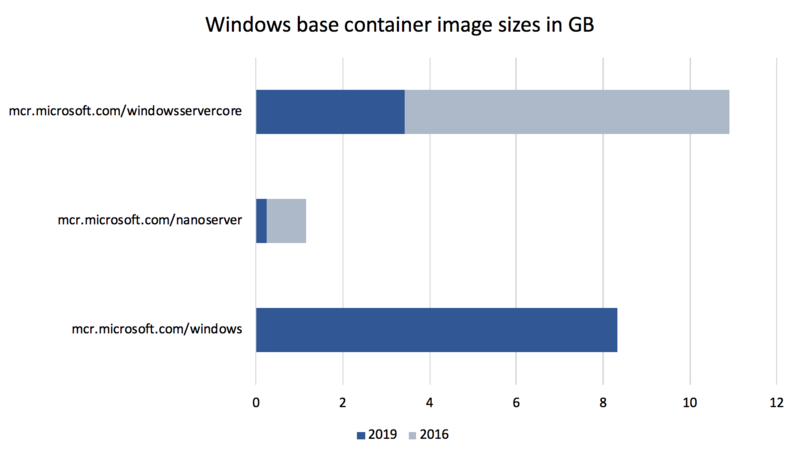 Stefan Scherer, senior software engineer at SEAL Systems, compared container sizes between Server 2016 and 2019 and found the 2019 images were ⅓ to ¼ of their equivalent 2016 image. Microsoft and Docker have been partnering on bringing containerization to Windows since 2014. Container support was first added in Windows Server 2016 which ships with Docker Enterprise Engine. In 2017, they added support for managing mixed Windows Server and Linux clusters in the same Docker Enterprise environment using Swarm. Support for the SAC Windows 1709 and 1803 releases was added in 2018. Plans for 2019 include supporting both Swarm and Kubernetes orchestrators interchangeably in the same cluster. Server 2019 includes enhanced support for running Kubernetes workloads. Docker and Microsoft are now working to support Windows workloads with Kubernetes while using Docker Enterprise.